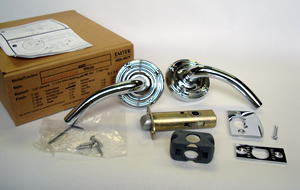 Browse the entire line of Emtek lever handles below. Just click on the style you like and you'll be able to order the door lever function that you need. Many of these solid brass lever handles may not be available as a locking entrance function. For exterior doors we recommend using an Emtek passage function lever in conjunction with a deadbolt, or take a look at the Emtek keyed locks with sideplates. These are basically just a passage lever with a deadbolt all in one unit. Should you have any questions regarding Emtek door hardware, please give us a call at 877-852-9449. *Each lever below is available in multiple backplates and finishes. Emtek has created a large selection for doorknobs, lever handles, handle sets, mortise locks, bathroom hardware, cabinet hardware and other home hardware products in coordinating finishes. Nearly all of Emtek hardware is made of solid brass for long lasting quality. Customers can choose from a wide variety and even mix finishes and styles on individual lock sets. Should you have any special needs or requirements, please let us know. All Emtek orders are assembled and shipped from City of Industry, CA. Because of the quality of the locks and their customizable nature, door knob orders are assembled at the time of the order. Please allow 3-5 days before shipment. For any specific questions about Emtek door hardware please give us a call at 877-852-9449. - Keyed locks and Privacy will include Keys or unlocking tools, dummy levers are surface mounted and do not include latches and strikes. Emtek locks have heavy duty mechanisms designed to provide trouble free service. Knobs and lever handles are supported by springs mounted behind the rosettes and sideplates. These springs return the handles back to the rest position and prevent lever sag. Emtek latches are heavy duty construction with strong internal spring and solid brass bolt. 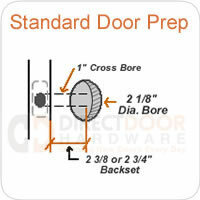 Spindles are sring loaded "half spindles" for smooth operation even on imperfect door prep. Emtek knobs and lever handles have a set screw design which, when tightened, eliminates the loose handle feel you get with other brands. Set screws do not hold the handle on, but serve to remove the loosness. Emtek handles and rosettes are forged, not cast or stamped, providing a flawless surface which can be highly polished when desired. The generous thickness and weight of forged parts gives them a solid look and feel. Emtek lever handles are available in several functions the most common being keyed entry, privacy (bed and bath), passage (hall and closet) and single dummy. Each function is used for little different application. Emtek keyed entry lever handles use a Schlage C 5-pin keyway. Keyed entry levers have a turn button on the interior side of the lever. Lock from inside by turning the turn button. Inside lever functions even in locked position for quick egress but lever handle remains locked until unlocked by turn button or key. Unlock from the outside using a key. The lever handle is only locked when the push button is in the locked position. Many Emtek lever handles are not available with a keyed entry function because a key cylinder would drastically change the look of the lever. In this case we recommend using a passage function lever along with an Emtek deadbolt for a door that requires keyed entry. Emtek privacy locksets lock by pressing push pin on the interior rosette. You do not need a key to unlock from the outside. There is no key cylinder, but there is a pinhole through which you can unlock the door using the generic tool provided. Privacy locks are generally used on bedroom or bathroom doors. Emtek passage lever handles are non- locking. These are great for hall doors or closet doors that do not need to lock, but a latching mechanism is still required. Also use a passage function lever handle along with an Emtek deadbolt for keyed entry. Emtek dummy levers are sold as a pair. These are non-functioning lever handles that are mounted to the surface of the door. Used on doors that do not need a latch mechanism like the inactive side of a french door for example. Single dummy lever available upon request.